The United States Mint stopped selling its range of numismatic gold coins Tuesday, August 9, at 11:20 a.m. Eastern Time as the record high price of bullion approached their sales prices. Visitors to the coins’ online product pages will see the notice: "This product is temporarily unavailable for product repricing." The Mint said it intends to make the gold coins available by the afternoon of Wednesday, August 10, after price increases have been implemented. "The United States Mint (http://www.usmint.gov/) reserves the right to discontinue sale of gold numismatic products in the event that the selling price of United States Mint gold bullion products begin approaching the sale price of the gold numismatic products," the bureau’s coin pricing policy states. United States Mint coin pricing methodology employs an average for gold based on AM and PM London fixings from the previous Thursday to current Wednesday. When the average swings outside predefined $50 ranges, gold coins go off sale as their prices are adjusted — a process that typically takes just a few minutes and generally happens before noon Eastern Time on Wednesday. Prices for gold coins were last raised by the United States Mint on Wednesday, July 27, when the yellow metal settled within a $1,600.00 and $1,649.99 an ounce range. Gains have since continued, soaring $77 in the last two days alone. The London PM Fix gold price was $1,736.00 an ounce on Tuesday. (See current gold prices.) The ballistic rise not only resulted in the early and extended coin suspensions, but could lift their reintroduced prices into a higher-than-expected level. Already and without the required Wednesday London AM fix in the computations, the London gold average stands at $1,697.03 an ounce. If the Wednesday AM fixing comes in at $1,723.75 an ounce or more, a second higher level of prices will kick-in for the gold coins, as noted below in the "Price Tier 2" column. If the fixing falls below $1,723.75 an ounce, the first tier of price increases would go into effect. The second tier seems most likely as of this writing, as gold futures in New York settled at $1,743.00 an ounce. Note: Price Tier 1 represents a pricing range of between $1,650.00 to $1,699.99 an ounce while Price Tier 2 indicates a range of between $1,700.00 and $1,749.99 an ounce. United States Mint investment-grade coins, like the bullion versions of the 22-karat American Gold Eagle and 24-karat American Gold Buffalo, do not have a fixed weekly price like proof and uncirculated gold products. They are instead sold for a small amount over the current spot price of gold. Meanwhile, as gold prices have soared due to safe-haven purchases driven by global economic concerns, industrial precious metals like platinum have fallen. 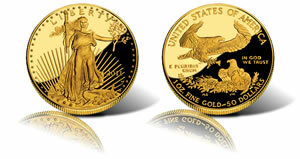 As a result, collectors on Wednesday should also expect a $100 price cut for the 2011 Proof American Platinum Eagle. The .9995 proof coin had its price increased to $2,092.00 on July 20 when platinum moved within a range of between $1,750.00 and $1,849.99 an ounce. The current average, again without considering the required Wednesday AM Fix, is at $1,727.13 an ounce. The Wednesday AM fixing would need to surge above $1,936 an ounce for the Eagle price to remain unchanged. That is extremely unlikely. The proof American Platinum Eagle price will fall to $1,992.00. CoinNews.net’s U.S. & World Coins section offers information and specifications for each of the coins listed above. Anyone know if the MINT will honor Gold Coin orders entered prior to this morning’s price suspension at the earlier lower price? Or will I get a notice that my order will now cost me $50.00 more? How do they typically handle this? Cost of first spouce coin $966.00. Melt value of gold $861.50. Net profit to the mint more than $100 per coin. This is not enough however, they can get $50 more by jacking up the price but not right away, so they suspend sales. Sounds like greed to me. And yes, they honor on line sales submitted before the suspension, at least that was what they have done before. Greed is right. You think that they would lower the price of the ATB 5 oz silver pucks since silver prices crashed, but nooooooooooooooo. They are charging the customer $285 for 5 oz of silver, which happens to be the price APMEX was going to sell the 2010 bullion pucks at until the mint said NO thats too high! Hypocrites!